NASA launched the Orbiting Carbon Observatory-2 on July 2, 2014 to monitor atmospheric carbon dioxide from space. NASA has launched its first spacecraft devoted to monitoring atmospheric carbon dioxide, the heat-trapping gas thought to be responsible for much of Earth's recent warming trend. 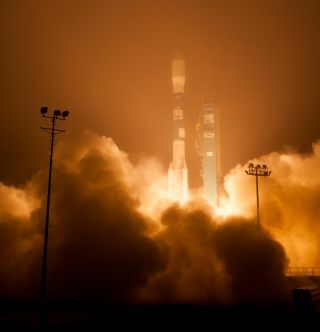 The space agency's Orbiting Carbon Observatory-2 satellite (OCO-2) blasted off today (July 2) from Vandenberg Air Force Base in California at 5:56 a.m. EDT (0956 GMT, 2:56 a.m. local time), carried aloft by a United Launch Alliance Delta 2 rocket. The liftoff was originally scheduled for Tuesday (July 1), but a problem with the launch pad's water system caused a one-day delay. NASA's OCO-2 spacecraft separating from the rocket that brought it to orbit. "With the launch of this spacecraft, decision-makers and scientists will get a much better idea of the role of carbon dioxide in climate change, as OCO-2 measures this greenhouse gas globally and provides incredibly new insights into where and how carbon dioxide is moving into, and then out of, the atmosphere," Betsy Edwards, OCO-2 program executive at NASA headquarters in Washington, D.C., told reporters during a pre-launch press briefing Sunday (June 30). Atmospheric carbon dioxide levels have risen from about 280 parts per million (ppm) before the Industrial Revolution to 400 ppm today, the highest concentration in at least 800,000 years. Humanity is primarily responsible for this increase, researchers say. The species pumps 40 billion tons of CO2 into the atmosphere every year, chiefly by burning fossil fuels such as coal and gasoline; the planet's natural sinks remove just 20 billion tons annually, on average. The new satellite will then begin using its single scientific instrument, a grading spectrometer, to measure carbon dioxide levels with an anticipated precision of 1 part per million, NASA officials have said. The spacecraft will zoom over the same swathe of Earth once every 16 days, allowing researchers to track changes in CO2 concentration over a variety of timescales. The Delta 2 rocket carrying NASA's OCO-2 spacecraft stands on the launch pad on July 2, 2014. "Ultimately, scientists predict that looking at these changes over time will give us patterns that are weeks or months or years long [and] that will help them to unravel the mysteries of the carbon cycle," Edwards said. The $465-million mission has a nominal lifetime of two years, but the spacecraft has enough fuel to keep operating for much longer than that, OCO-2 team members have said. This marks NASA's second attempt to monitor atmospheric carbon dioxide from orbit. The space agency's original Orbiting Carbon Observatory (OCO) satellite crashed into the Pacific Ocean in February 2009 shortly after launch, when the nose-cone fairing of its Orbital Sciences Taurus XL rocket failed to open properly. The original OCO mission cost just $275 million. The higher price tag of its successor, which features a nearly identical spacecraft, is partly a result of the decision to go with a different, bigger rocket, NASA officials have said. The OCO-2 craft is the second of NASA's Earth-observation satellites to blast off in 2014, after the Global Precipitation Measurement Core Observatory, which launched Feb. 27. The space agency plans to loft three more Earth-science missions this year: the free-flying Soil Moisture Active Passive spacecraft, as well as ISS-RapidScat and the Cloud-Aerosol Transport System, two instruments that are slated to be installed aboard the International Space Station.